Rauma is a town and municipality of ca. Get a sense of the local culture at Rauman Merimuseo - Rauma Maritime Museum and Automobile Museum. Appreciate the collections at Laukko Manor and Bonk Museum. 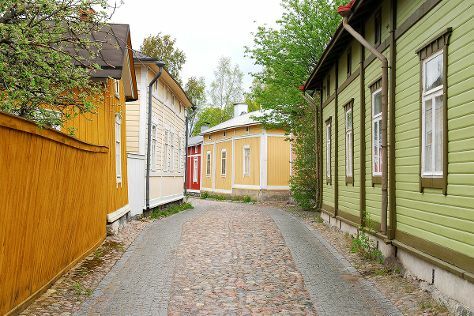 You'll find plenty of places to visit near Rauma: Louhisaari Manor (in Askainen), Sastamala (St Olaf's Church in Tyrvaa & Pukstaavi) and Pori (Juselius Mausoleum, Pori Art Museum, & more). There's lots more to do: get to know the fascinating history of Old Rauma, explore the different monuments and memorials at Burial Site of Sammallahdenmaki, see the interesting displays at Marela Museum House, and enjoy the sea views from Kylmapihlaja Lighthouse Island. For more things to do, where to stay, other places to visit, and other tourist information, you can read our Rauma travel route website . If you are flying in from Canada, the closest major airports are Helsinki Vantaa Airport, Turku Airport and Tampere-Pirkkala Airport. In July, daily temperatures in Rauma can reach 24°C, while at night they dip to 13°C. Finish your sightseeing early on the 21st (Sun) to allow enough time to travel back home.